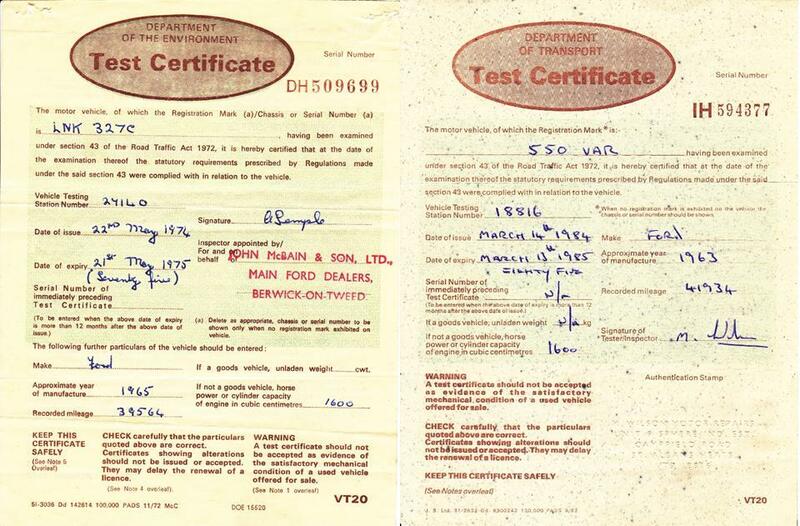 It’s not very often that classic cars have a full and traceable history, and that is particularly so with Lotus Cortinas. They were built to race and rally, and by the time the 2nd or 3rd owners got hold of them, they were pretty well used up, and there certainly wasn’t much interest in maintaining the ‘history’ of the car. For an ex-Works Prototype car to have a traceable history, and a description of the work completed on it, is virtually unheard of, but 550 VAR is the exception. 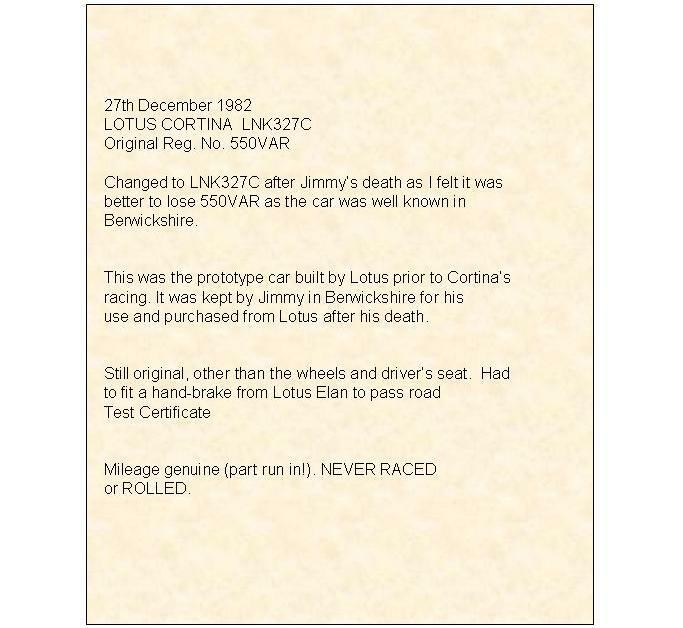 550 VAR was owned by Lotus from 1963, until Jim Clark’s death in 1968. Jimmy kept the car on his estate in Berwickshire from 1964 onward, and used it right up until 1968. Those two facts alone are so unusual. Firstly, that a company as forward looking as Lotus should keep a car for a year would be unheard of, but to keep an old Mk 1 Lotus Cortina for 5 years, and 2 of those after it had stopped production, is just incredible. And then to consider that a twice World F1 Champion kept his ‘company car’ for so long, and the car was well known around Berwickshire as ‘Jimmy’s car’, just adds to the intrigue of this car. 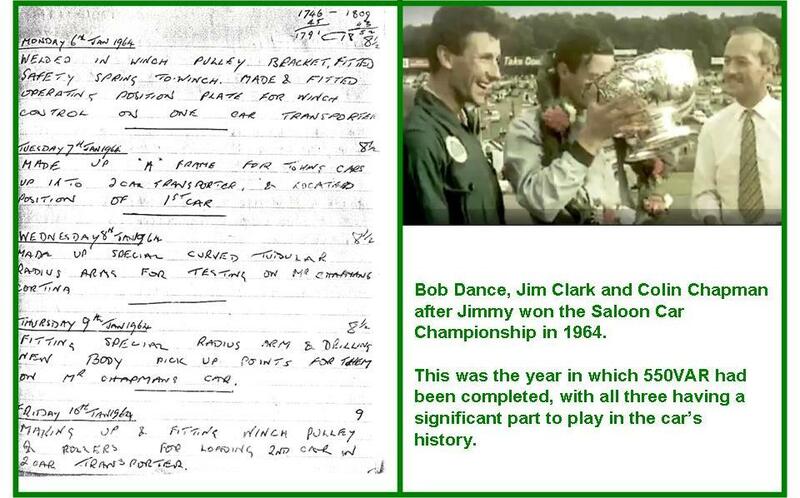 Another fascinating bit of history of the car is recorded in Bob Dance’s diaries of the time, where he records the work completed on the ‘prototype IRS car for Ford’, which quickly becomes ‘Jim Clark’s car’ after Colin Chapman asked Jimmy to drive it up to Scotland and back to see what he thought of the new independent suspension setup. After Jimmy’s death in 1968, 550 VAR was bought from Colin Chapman by his brother-in-law Alec Caulder. Alec was not just Jimmy’s brother in law, but was also one of the early member of Border Reivers race team in which Jimmy had his first drive. 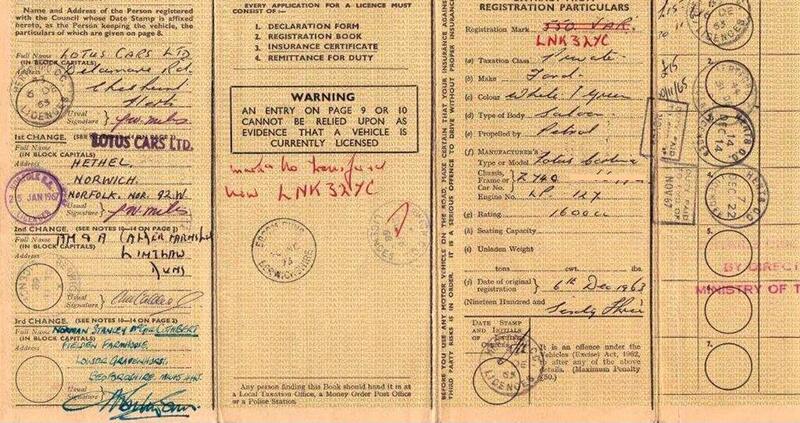 Alec lived near to Jimmy’s estate, and had the registration number changed to a private number (LNK 327C) as 550 VAR was so well known, and he didn’t want to draw attention. Alec kept the car for many years, and in the mid 1980s, it was acquired by Andy Middlehurst. Andy knew exactly what the car was, and re-united it with it’s original registration number, after checking with Alec and Bob Dance that the car was correct. Shortly after restoring the car, Tom Walkinshaw (TWR / JaguarSport) bought it for his collection, where it stayed for a few years. When Tom’s collection was sold off, 550 VAR was bought at auction by Trevor Barefoot, who treated the car to another restoration, and although little needed doing, the car was fully stripped, re-painted and detailed to raise the standard of the car to as-new condition. Will bought the car in late 2013, and has set about getting the car looking as good as possible, and most importantly, getting it to run properly as well. It has a very low, documented, mileage (just over 43,000), and has few miles put on in the past 30 years. In February 2013 the car was displayed at Race Retro, an exhibition held at Stoneleigh Park to showcase classic race and rally cars, primarily from the 50s to the 80s. Will was approached by a chap who claimed to have some of the original documentation for 550 VAR, and that has since been re-united with the car. 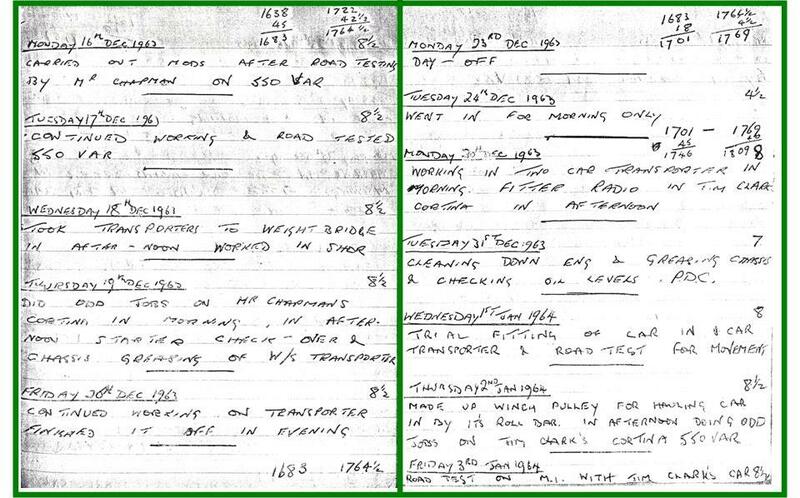 That included the original buff logbook and some old MOT certificates, which complete the provenance of the car with regards Lotus ownership and the change of registration number by Alec Caulder. There is so much important information on this one small document. 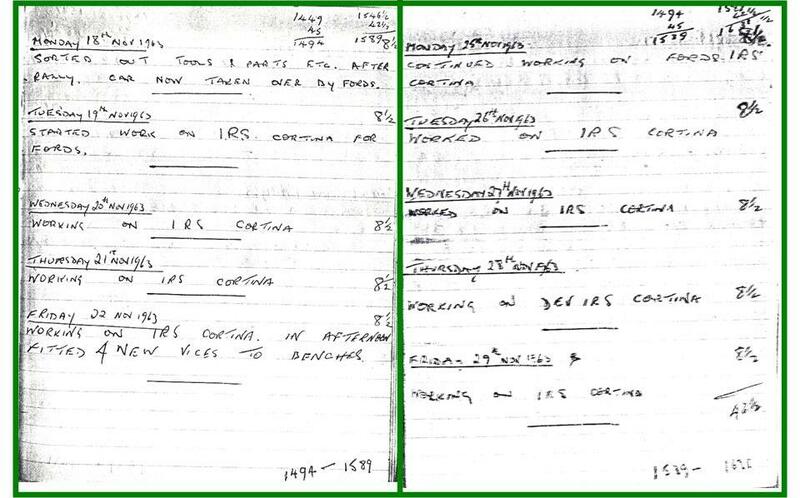 The next few images are extracts from Bob Dance’s diary, where the build of the IRS Lotus Cortina is documented. There are conflicting reports that , on one hand, two IRS prototype cars were built, and on the other, that two goes were made on developing the IRS on a single car. The first attempt held the IRS setup in a tub attached to the boot floor, and it was obvious pretty quickly that this setup was too weak to function properly. The 2nd setup was as fitted to 550 VAR. 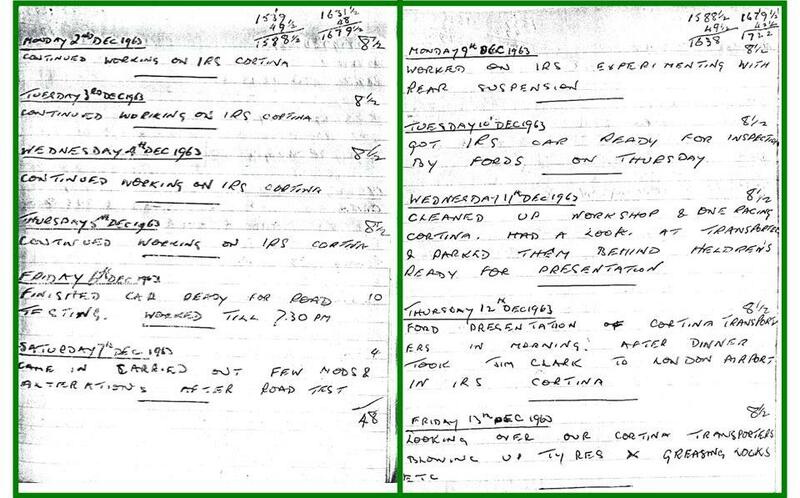 So, if two cars were fitted with prototype IRS system, what happened to the first car (167 RUR from Bob’s diary)? It certainly wouldn’t have been scrapped, but there is no record of it carrying on racing. Indeed, it is well documented that 166 RUR and 168 RUR went out to the USA to race in the 1964 series out there, but no mention of 167 RUR. 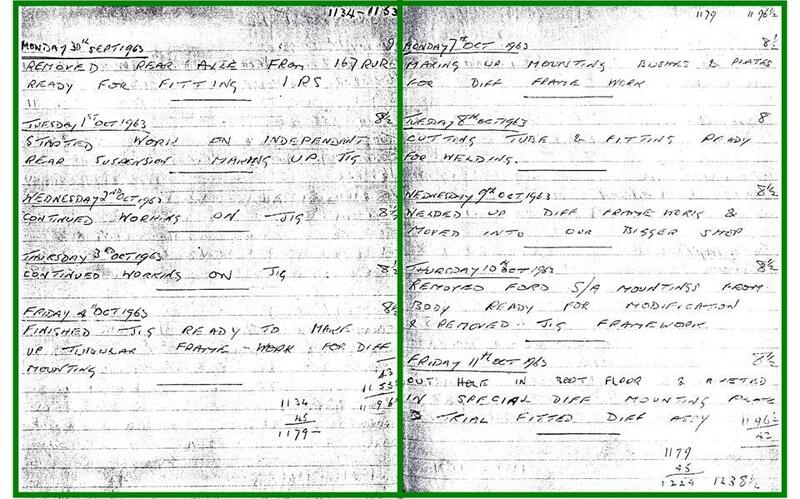 Bob Dance has recently confirmed that there was only one car modified with IRS, and that is recorded in his diary as 167 RUR. There are some fascinating bits on 550 VAR that indicate that it had a former life. It seems certain that this car started off as 167 RUR and with the rear suspension modifications and S/E specification engine was registered as a new car, 550 VAR. This gave Jimmy the unique opportunity of having the only Lotus Cortina with independent rear suspension, AND the car in which he completed his first race, 1st in class and 2nd overall. He put so much into the development of the Lotus Cortina, and went on to have so much success racing them, that it’s little wonder that he kept this very special car for the rest of his life. 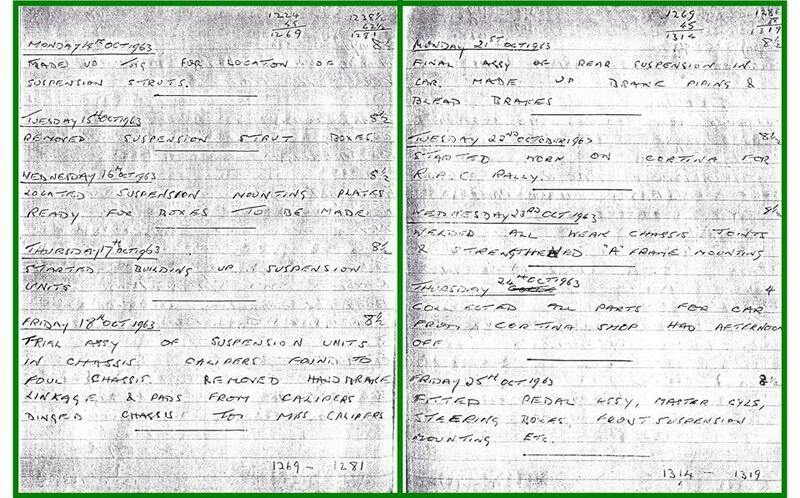 Here are the diary entries. There are a couple of weeks break here from the IRS project as the ‘rally car’ (786 BOO) is prepared for the RAC Rally in November.